And then there were three. Standard & Poor’s decision to strip the Netherlands of its triple-A credit rating leaves only Germany, Finland and tiny Luxembourg enjoying top-notch status in the euro zone. It is hard to argue with the assessment, but it would be wrong to see the downgrade as a red flag about the country’s economic health. While the Netherlands’ recovery from its housing bust is all too slow, property prices are bottoming, debt is low and reform is underway. Other euro zone members are bigger worries. Having been the laggard among the more prudent euro zone members, the Dutch economy has started showing signs of growth, with GDP expanding 0.1 percent in the last quarter. European Commission forecasts show it growing by 0.2 percent next year – that’s below the euro area’s expected 1.1 percent expansion, but would reverse the 1 percent contraction expected in 2013. Unlike most problematic euro zone states, the Netherlands’ main drag was not fiscal profligacy or excessive current account deficits. It was a massive housing bubble, inflated by favourable tax laws and low mortgage rates. The bust triggered widespread deleveraging while a recessionary squeeze on real wages and relatively high inflation have shrunk disposable income, hurting consumption. The government’s commitment to austerity has further weighed on demand. In September, it announced 6 billion euros of measures to tackle a manageable but growing deficit, forecast to be 3.3 percent of GDP this year. The unemployment rate has also increased, reaching 7 percent in October, although it is lower than the euro zone average. The Dutch economy remains far sounder than most its peers’. The debt-to-GDP ratio is forecast to reach 75 percent, well below the euro area’s 96 percent average. Second-hand house prices rose for the first time in three years on a quarterly basis in the third quarter, according to Rabobank Research. No wonder the markets feel that S&P is telling them nothing new. The loss of another triple-A crown is a blow for the euro zone, coming after France’s migration to double-A status earlier in November. But the Netherlands is structurally sound and, unlike reform-resistant France, is taking steps to foster a sustainable recovery. 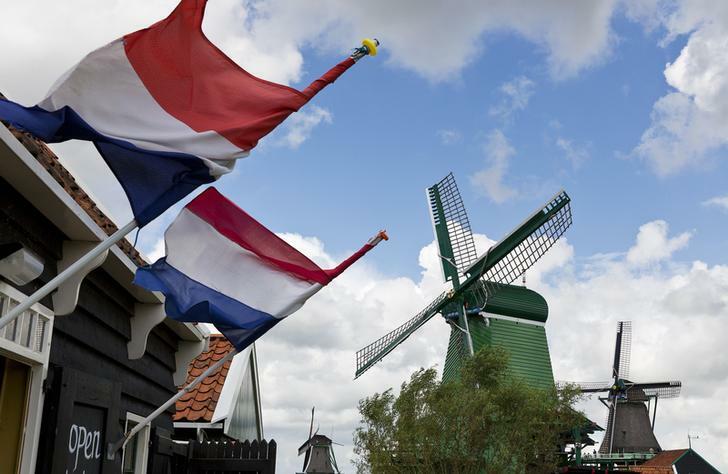 The famous Dutch windmills of The Zaanse Schans in Zaandam are locked in a fixed position August 13, 2013. Standard & Poor’s cut the Netherlands’ triple-A credit rating to “AA+” on Nov. 29. The ratings agency said the decision was due to a worsening of growth prospects. The decision leaves Germany, Luxembourg and Finland as the only countries in the euro zone with a triple-A rating.